This is my favorite time of the year for sure. We just had Halloween (love), my birthday is approaching (November 15- send gifts! ), Thanksgiving is around the corner and then the whole rest of the year is full of holiday preparations and events. Wearing Lynnderella Fruitcake Juice is making me really excited for the upcoming holiday season. 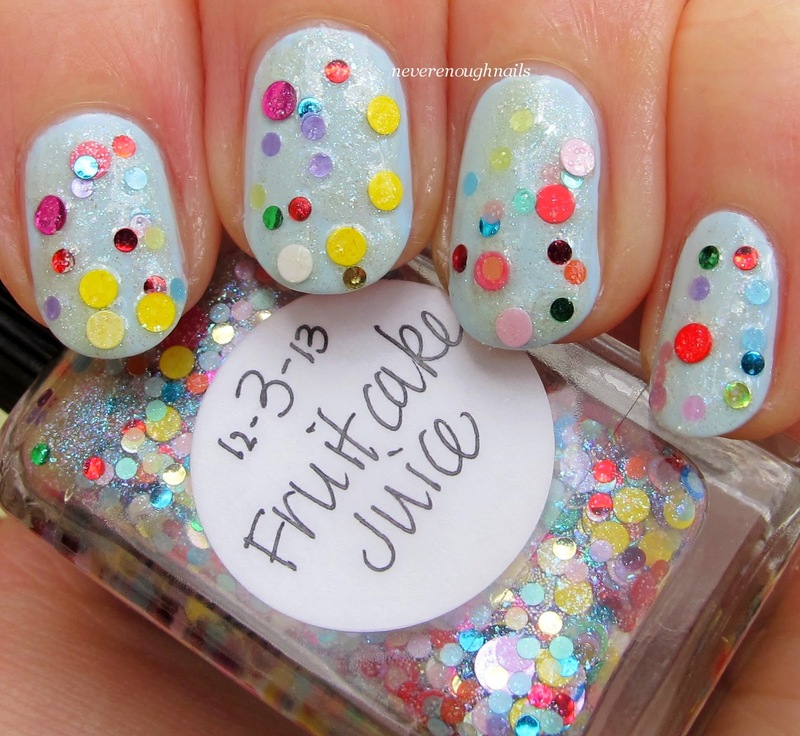 Fruitcake Juice is a limited edition Lynnderella from last year's Advent collection, one of my favorite things that Lynnderella does. Every day in December leading up to Christmas, there is a new special polish to look forward to and I always think she goes all out for the Advent polishes. 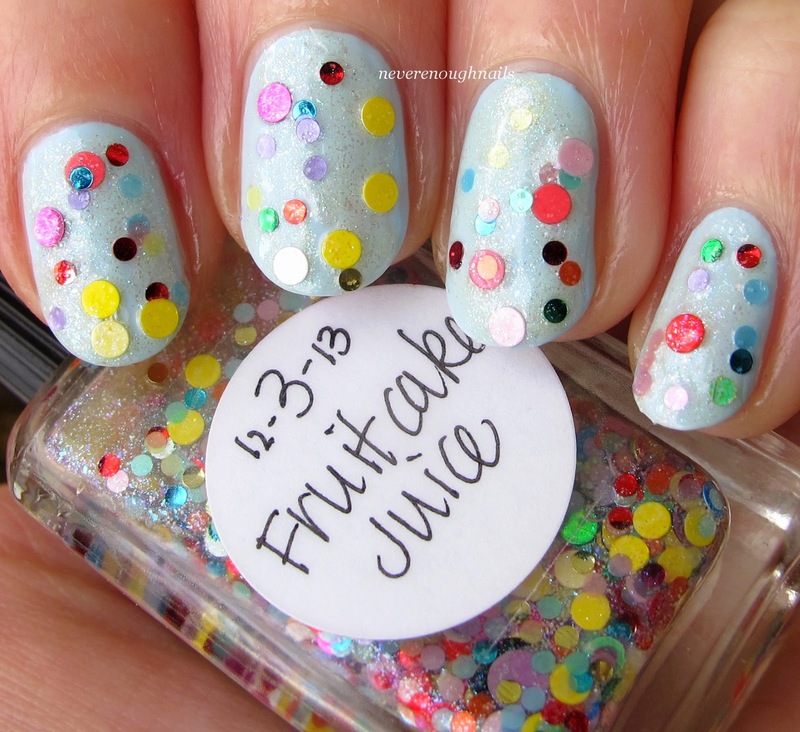 Fruitcake Juice was released on 12/3/13 and is a gorgeous mix of circle glitter in all different colors and sizes. There are both matte and shiny circle glitters as well, so it's a really good mix of seemingly every variety of circle glitter in a silver shimmered base. This is one dabbed coat of Fruitcake Juice over Zoya Blu. Dabbing is definitely the best way to apply this polish, as the circles can get stuck together otherwise. There is plenty of glitter in this, so no fishing is needed and the shimmer is plentiful too. The consistency is lovely. It's right on par with other Lynnderellas- they are never thick and goopy like other glitter heavy polishes can be. So why am I showing you this limited edition awesome polish from last year? Because it's available RIGHT NOW on lynnderella.com! That's right, a small number of the 2013 Advent LEs are being listed on lynnderella.com and the Lynnderella StorEnvy shop, so if you are dying for any of them, keep your eyes peeled. 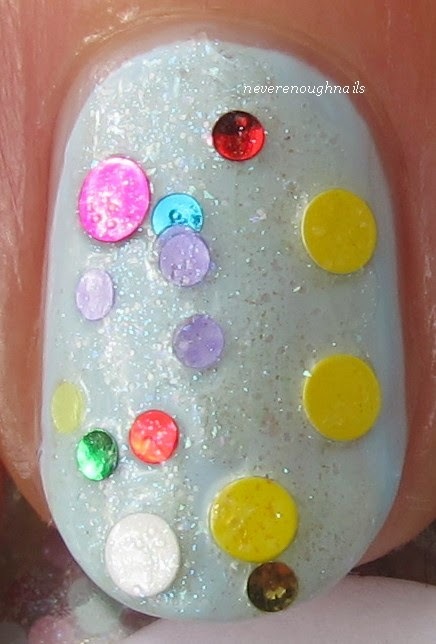 For more information about Lynnderella polish, visit Lynnderella's blog. I love it so much Ananka! I am really glad I got this one.